Welcome to historic and vibrant, Bangor, Maine. The last two editions of Macmillan’s Places Rated Almanac have rated Bangor the best of the North American metro areas with a population under 100,000. Bangor has all the opportunities that larger cities have without all of the problems. Bangor, Maine is Maine’s Queen City. There are a number of hotels and motels in the Bangor metropolitan area to stay at while visiting. Local shopping includes downtown Bangor stores and boutiques and the Bangor Mall. The town of Bangor was originally known as Conduskeag. At first, many residents of the town during the mid to later 1700’s wanted the town name to become Sunbury, but was never granted by the General Court. The name Bangor later came from Reverend Seth Noble which he got from one of his favorite hymns. Vince McMahon promoted his first professional wrestling event in Bangor in 1979. 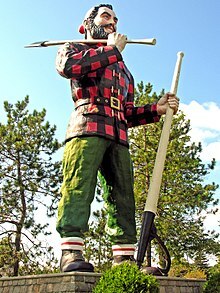 Bangor is the site of the famous Paul Bunyon statue in Maine. 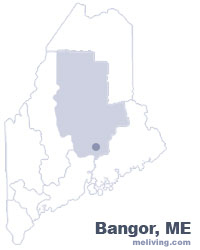 To share any Bangor, Maine information with us, please contact us.